Click here to break free of others' frames. Our friend George McClellan has released two new CDs! 9/3/99 "Chicago Rapid Transit" was written on April 12, 1999 by George McClellen and dedicated by him to the memory of John Roache. In George's words, it's "sorta in the style of Zez Confrey and Robin Frost." Arranged and sequenced 8/99 by Irwin S. Schwartz. Hey, fans.. It's finally here! 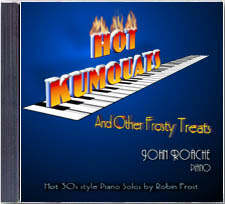 "Hot Kumquats and other Frosty Treats"
Click HERE for complete details, RealAudio Sound Clips, Reviews and ordering information for this and my other CD, "Syncopated Odyssey". I think they like it! I have been getting some nice reviews and fan letters. The companion Music Folio to my new CD. This is the first NEW music of Robin Frost to be published in TEN years. Contains 18 new compositions. Click HERE for complete details, online MIDI excerpts of all 18 pieces, and ordering information. Unless otherwise noted, all of the MIDI sequences at this site are my own. The music you will be listening to is my MIDI sequence, "The Baltimore Todolo" By Eubie Blake (Scott Kirby's arrangement). If you didn't hear any music, please don't send me e-mail. You need to configure your WWW browsing software. Ragtime Store Opens I have had so many requests for ragtime music recommendations that, in association with Amazon.com, I have opened a RAGTIME STORE here in the lobby of the Library. I have searched and researched the Amazon.com database of available material and present my recommendations here for you to purchase. These are all items which I have in my own personal library and I only recommend what I know. All the items in the store are neatly catagorically arranged in tabular form and are just a click away from the purchasing source. I think you will appreciate and use this handy service. on 88-note piano rolls so now you can play my music on your player piano. Article in the Sunday, July 6, 1997 issue of the Baltimore Sun features the Ragtime Midi Library! What is Ragtime, Novelty and Stride Piano Music? For those of you who wanted to know but were afraid to ask (and even for those who asked! ), I have written a short multimedia history and comparison of Ragtime, Novelty and Stride Piano music. Be sure to LOOK & LISTEN to this page. Ragtime performers/composers Scott Kirby, Frank French and David Thomas Roberts have formed their own record company, Viridiana. Read about all their new releases on their new Web Page. Tired of the pathetic music box sounds of your SoundBlaster sound card? Now you can upgrade to wave-table synthesis with this SHAREWARE program so a piano will finally sound like a piano on your computer. All for $20! Check Out WinGroove. I am pleased to announce that the Weber Piano Company has chosen me to be the featured performer in their "Great Music - Ragtime" feature. Please visit their site and take a look. Great Music logo © 1997 Weber Piano Co.
are BANNERS available for you to download and use on your web page. is owned by Brainbyte Media. and made possible by the Webring. The latest versions of both Netscape Navigator and Microsoft Internet Explorer handle frames better than earlier versions, so I recommend that you upgrade if you haven't already. If you have any problems dealing with the new frame layout, or any other comments and suggestions on the design of these pages, feel free to contact me. This site is maintained by Irwin Schwartz, who welcomes your comments and suggestions. © 1999 John Roache Music. All Rights Reserved. The MIDI performances available at this site are all performance copyright 1995-1999 by John E. Roache/John Roache Music and may NOT be used for any commercial use whatsoever without permission. The MIDI sequences may be freely distributed for non-commercial use only in their compressed .ZIP form with all attached text files. and HTML, and supersedes any other such notice as may be found herein. Click HERE for the rules about using John's music. 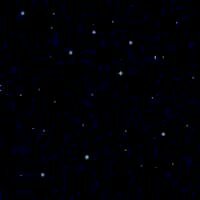 DISCLAIMER: Please note this is a FREE MIDI musical site. All the songs contained in this site are either in the public domain or the composer and/or publisher has given permission for use. The music and information on this website are intended only for the enjoyment of those who care to listen to it. If there is any infringement on anyone's rights, or any material on this site that the author objects to its use here, we will remove same on being notified. 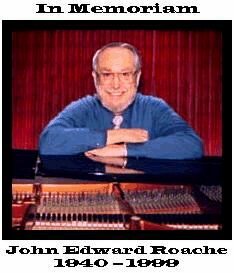 The Ragtime Midi Libraries of John E. Roache. Send E-MAIL.